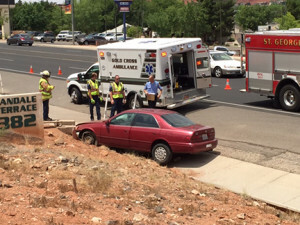 ST. GEORGE — A woman was taken to the hospital after crashing into a gutter on Bluff Street in St. George Tuesday afternoon. The woman, who is in her 60s, St. George Police Sgt. 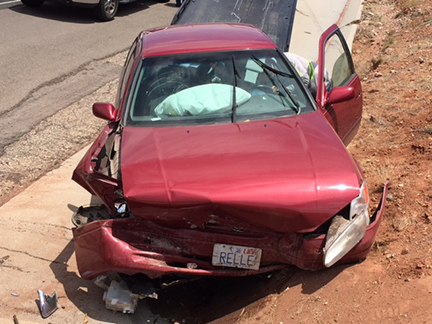 Dave Williams said, told police she blacked out and came to after she had crashed into a concrete barrier over a gutter just north of 400 South on Bluff Street. She was driving a red Toyota Camry northbound on Bluff at the time of the accident. The woman told police that she was sleep-deprived from the night before and must have dozed off. She did not report a history of similar episodes, Williams said. The woman was transported to Dixie Regional Medical Center by Gold Cross Ambulance with injuries to her upper body and knee. The woman was wearing a seat belt at the time of the accident, which is probably the reason she was not ejected from the car, Williams said, as the impact was pretty hard. The Camry had to be towed from the scene due to extensive damage to the front of the car. Because of the size of the shoulder on that section of road, Williams said, traffic was not held up as a result of the collision. Police are still investigating the incident to determine whether or not to issue a citation to the woman. While officers checked the woman for signs of impaired driving, they did not find anything to suggest a DUI, Williams said. St. George Fire Department also responded to the accident. Sounds like she may have gone hypoglycemic ( low blood sugar ) . Too many health care workers fail to notice low blood sugar . This problem often increases with age so people over 50 should do checks if they feel drowsy during the daytime . Did you read what she said? She was sleep deprived from the night before. So therefore her being sleepy during the day is doubtfully due to low or high blood sugar. She’s not that old to have been at Mesquite late or just not being able to sleep. But I highly doubt it was low or high blood sugar. How about issuing tickets for being a big fat liar! I can hear the dialog now. Driver: “Oh, I blacked out.” Police: “Do you have a medical issue?” Driver: “Oh um, well I didn’t sleep very well last night, ya that’s it, I didn’t sleep much so I must have dozed off.” There needs to be an idiot law and then make them take a bus for 6-months. Um yes she should be cited duh she didn’t properly stay in her lane. Good god every accident I’ve been reading about lately they’ve been given a citation for some kind of lane violation. I don’t care what age you are if you’re able to come up with that excuse you need to be cited. And CALIGIRL you got it right!!! Anyone causing an accident due to a medical episode should by law, have their license suspended until medically cleared by a qualified physician. Law makers need to tackle this issue, it seems to happen pretty often and could have been alot more tragic if someone happened to be standing in that particular spot when the driver blacked out.